Welcome to Bagels 'n Grinds with two great locations to serve you, Arundel Mills and College Park. 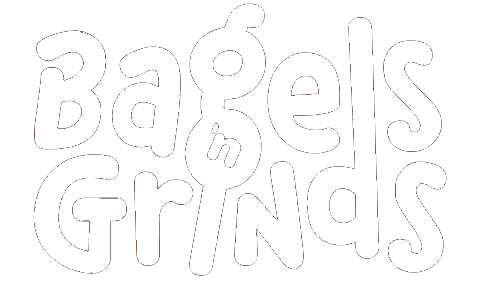 At Bagels 'n Grinds you can experience 16 different varieties of hot delicious bagels baked fresh daily from 5:30 a.m. and throughout the day as needed. Our bagels are authentic New York style bagels made just like they were 100 years ago. Bagels 'n Grinds bagels are crispy and crunchy on the outside and soft and chewy on the inside. Our secret to making the perfect bagel is in our 10-step proprietary process and includes using the highest quality ingredients, ultra-purified water and special handling of the dough. Top them off with a choice of 6 homemade spreads. Bagels 'n Grinds features a glass-enclosed $50,000 water treatment facility that is incorporated into the viewable baking process at the restaurant. "The ability to use ultra-purified water in the bagel-making process enhances the texture and flavor of our bagels." Greenberg states, "The water treatment process does not stop with the bagel recipe. Our water treatment facility makes 3 different types of water. We use this water in our Fair-Trade organic coffees at our 18-foot beverage station, so that our patrons receive only the best and purest products available." The beverage station includes: soda, six brews of fresh hot coffee, iced coffee and fresh brewed iced tea. Bagels 'n Grinds offers a menu of delicious sandwiches, salads and soups. On the warm side they offer, made-to-order Eggstreme Omelet Breakfast Sandwiches with the toppings mixed right in. All the egg sandwiches can be made with egg whites or egg substitutes. Sandwiches include hot baginnis (bagel Panini), as well as wraps. On the cold side, Bagels 'n Grinds delivers a fresh twist on Roast Beef, Turkey, Clubs and Veggie sandwich creations with delightful compliments like feta cheese and herb aioli. Watching your carbs? Bagels and Grinds offers a lighter carb solution by building their sandwiches, by request, on a "skinny" or "scooped" version of the bagel. Their extreme salad menu includes a Make-your-own-salad where you can choose your lettuce mix, gourmet dressings and toppings of protein, crunch and dairy. All lettuce and veggies are washed and prepared in-house. Bagels 'n Grinds never uses bagged lettuce and all of our poultry is cooked on-site. Your sweet tooth is easily satisfied with a variety of cookies, brownies, yogurt parfaits, plain yogurt and muffins all made on-site. "I am the world's pickiest eater", states Adam Greenberg, owner, "If I can't eat it and I cannot serve it to my family—I won't serve it to yours. "Dine indoors or out on our patio and enjoy amenities like our fireplace, free Internet access and our three oversized LED TV's. A semi-private conference area can be reserved for meetings and business gatherings. Adam Greenberg is the president and founder of Bagels 'n Grinds and Restaurant Zone, Inc., the company that manages Potomac Pizza restaurants in Chevy Chase, Potomac, Rockville and Gaithersburg and the Potomac Village Deli Catering in our Gaithersburg location. A lifelong Marylander, Adam has been giving back to his community for years. He is known to hundreds of Montgomery County school children as "The Pizza Man", due to the numerous Pizza Demos he has given at elementary schools. Adam teaches kids about cleanliness in the kitchen while helping them to make their own pizzas to bring home for dinner. In his newest venture, Adam has turned the bagel business into a science and not an experiment, spending countless hours seeking the perfect bagel and bagel recipe. With his extensive experience in "dough", pizza that is, Adam has taken the bagel by the whole and developed an authentic New York bagel right in Maryland's Northern Anne Arundel County. His civic accomplishments have earned him several awards such as the Potomac Chamber of Commerce Business Person of the Year, Service Guild Business Person/ Partner of the Year, and the Cabin John Volunteer Fire Department Community Partnership Award. He has been a member of the Board of Directors for the Potomac Chamber of Commerce since 1997. Adam lives in Potomac with his wife Courtney and their three children. The Greenbergs now add bagels to their daily diet of delicious dough! Executive Chef, Brad Barr, was born and raised in Hagerstown, MD where he played football, baseball and wrestled. He attended McDaniel College in Westminster, MD, graduating with a Bachelors of Arts in Biology. Throughout college, Brad worked in restaurants and had a love and passion for cooking. So, upon graduation, he attended Baltimore International College and received his cooking certificate. Twelve years later, Brad brings an impressive resume and wealth of experience to Bagels ‘n Grinds. He and his wife Diana were married in 2007 and welcomed a daughter Sofia in 2009 and Ava in 2012. Steve was born in Washington DC and raised in Bethesda MD. Growing up he had experience in both the bagel and pizza businesses. He went to college at Hamline University where he received his bachelor’s degree in business and graduated with honors. He went on to earn his MBA from the Carlson School of Management at The University of Minnesota. He has a wide range of management experience from the entertainment and real estate businesses to internet and restaurant companies. Steve brings this breadth of knowledge and love of food to Bagels ‘n Grinds where he oversees daily operations and will help guide our growth. Chris Martin was born and raised in Frederick, MD but is no stranger to all of the surrounding county areas . He started out as a Carry Out employee at our brother company, Potomac Pizza in Gaithersburg, MD and worked his way up to the Corporate Office in just a couple of years to be our Community Relations Manager. For the last several years, Chris has also been a professional bassist who has toured nationally and internationally with 2 major label signed bands where he personally booked tours, festivals and recorded 5 records. You may have even heard his music being played on MTV, VH1, E! and FUSE shows as well as on the radio. He has brought his business knowledge and people skills of dealing with the music industry into the food, community and customer service world. He helps with fundraising efforts, coordinating events and providing overall terrific customer service for several of our Elementary, Middle, High and Private Schools, PTA's, teams, groups, churches and local businesses. Chris has always used that as a template for success and to help with growth of our restaurants. Make sure you say hello the next time you come into the office!